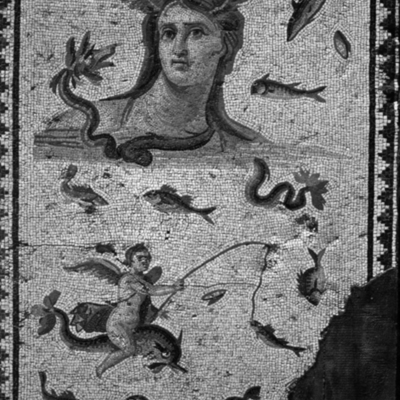 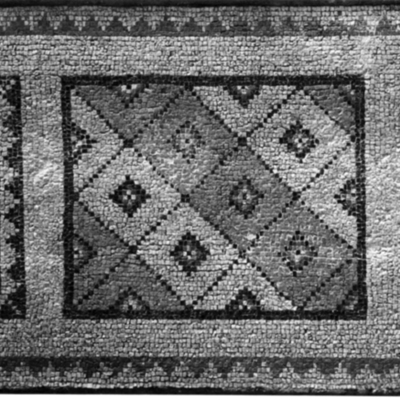 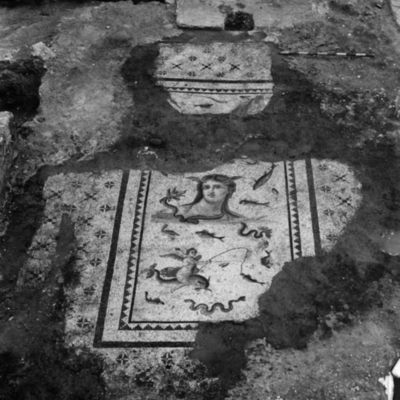 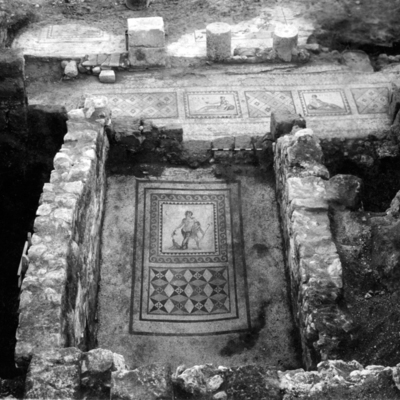 Late mosaic pavement over earlier floor. 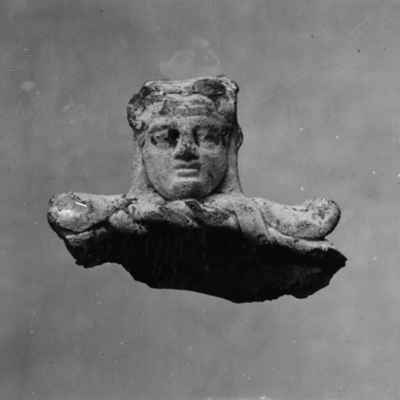 Statuette fragment found under Room 6. 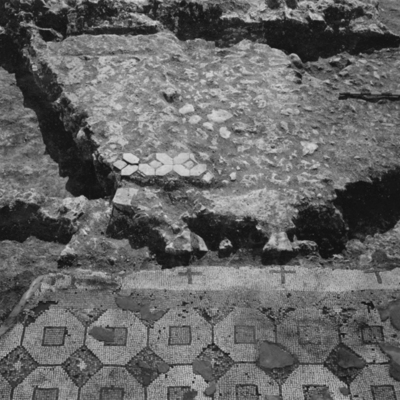 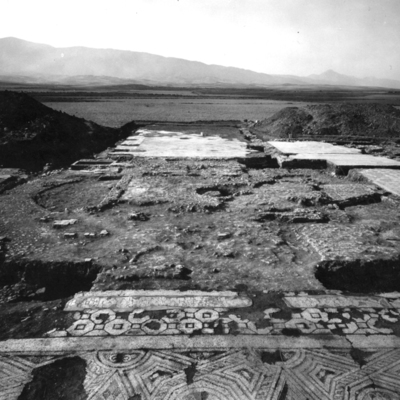 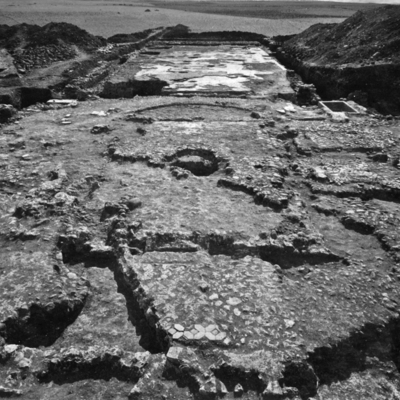 General view of mosaic floor in Room 6 the corridor. 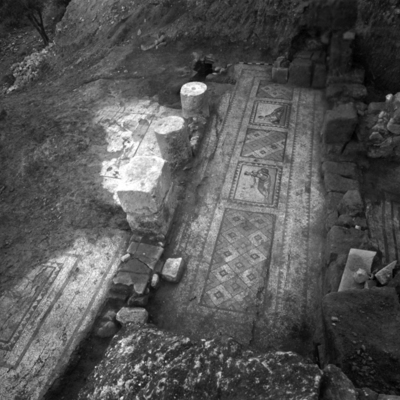 Rock tomb covered with tiles under the west wall of Room 6 Dig B. 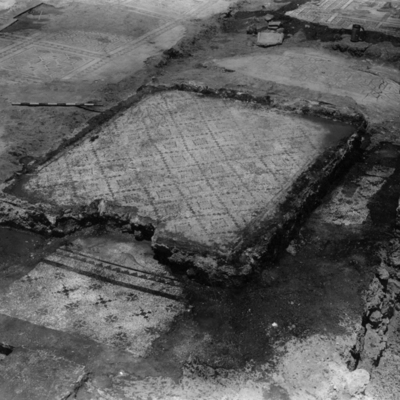 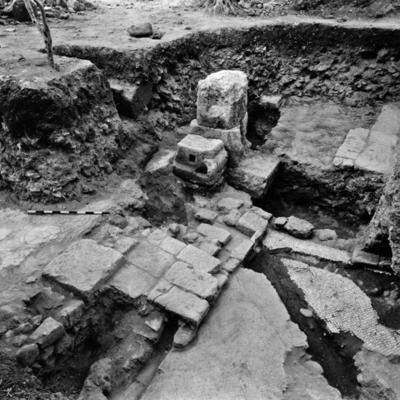 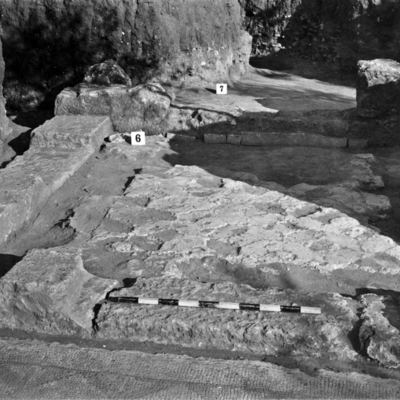 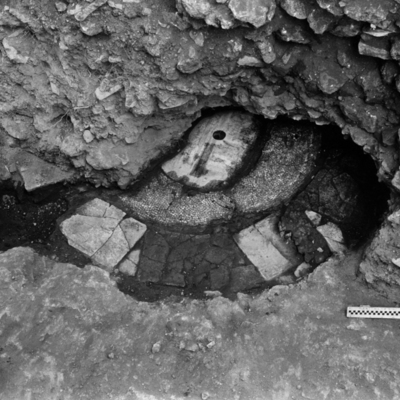 Rock tomb with tiles removed to show burial under the west wall of Room 6 Dig B. 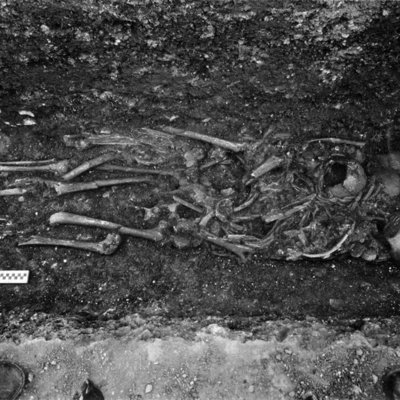 Detail of three skeletons in Dig E Room 6. 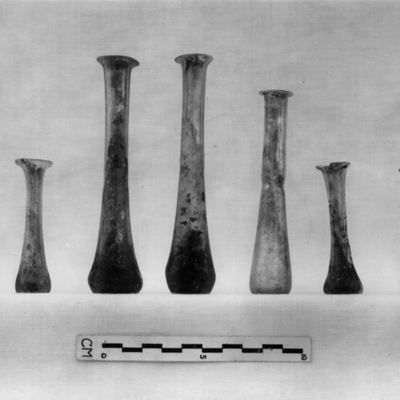 Long-neck glass bottles from Dig E Room 6. 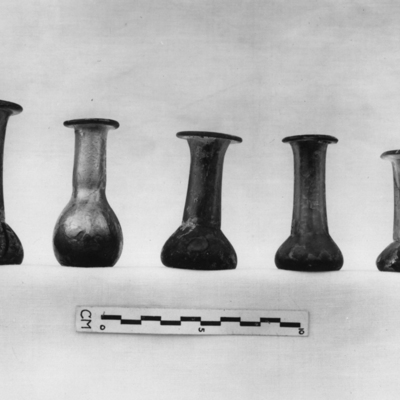 Glass bottles from Dig E Room 6. 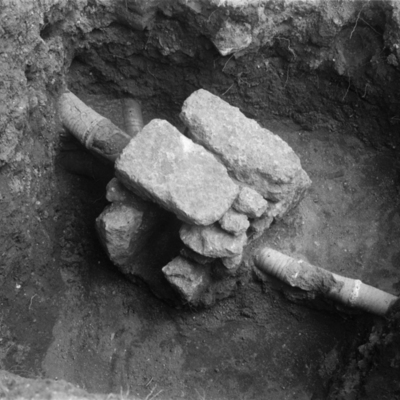 Excavations below Room 6 after removal of drain. 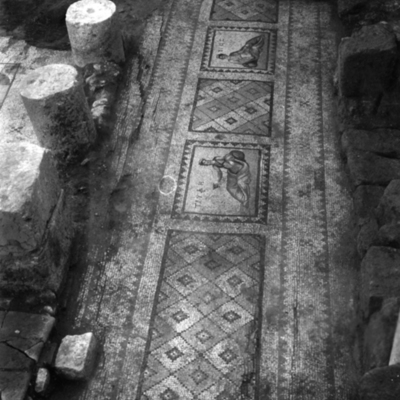 Drain under mosaic floor in Room 6. 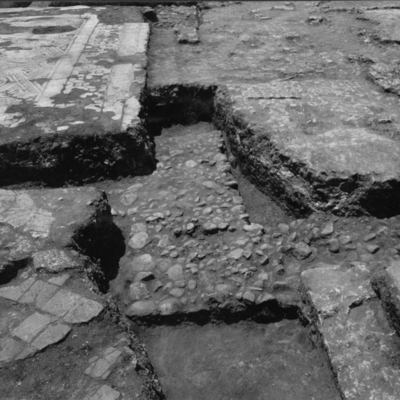 View after drain removal under Room 6. 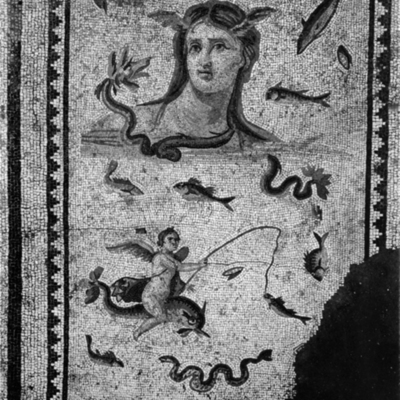 Mosaic from Room 6 showing personifications of Life & Luxury and a geometric panel. 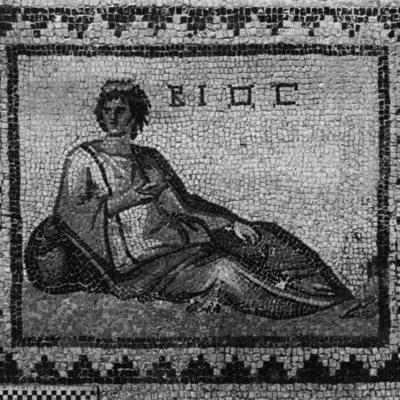 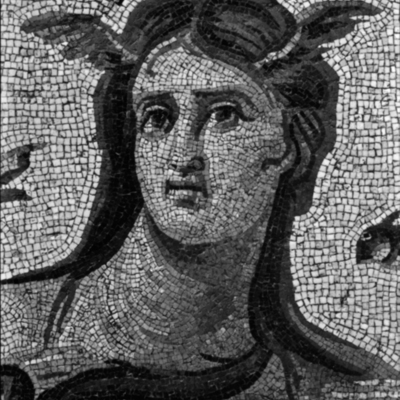 Detail of mosaic panel showing personification of Life Bios. 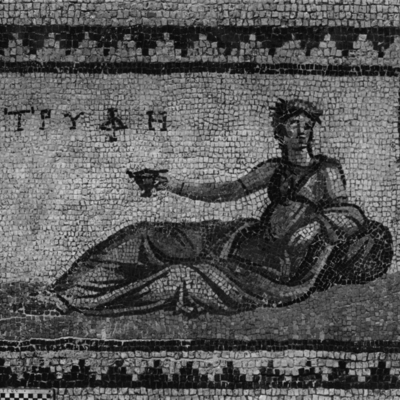 Detail of panel showing personification of Luxury Truphe. 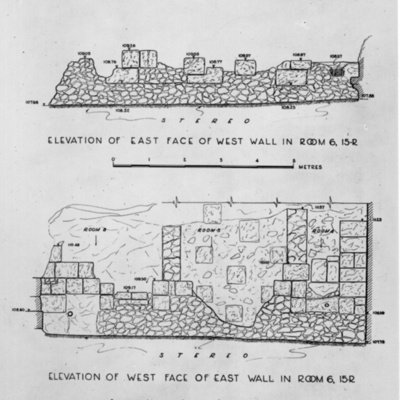 Elevations of east and west walls in Room 6. 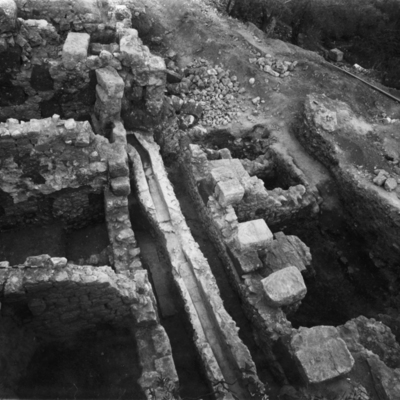 View of Room 6 with platform and apse. 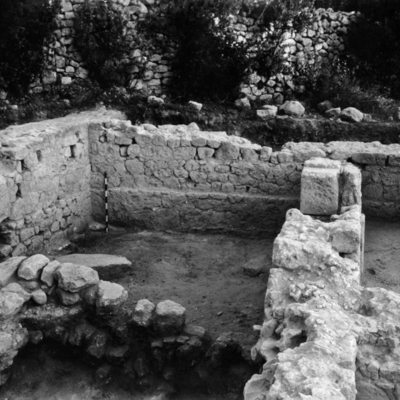 Detail of south wall of Room 6. 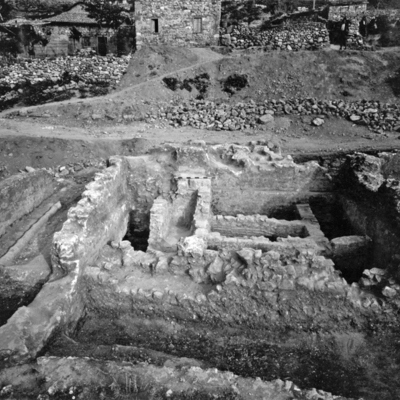 General view across Room 6 the central room with inscription 4 in foreground. 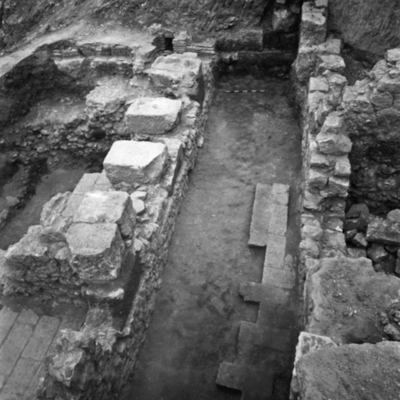 Detail of brick tomb in northeast corner of Room 6 with inscription 1 at rear right. 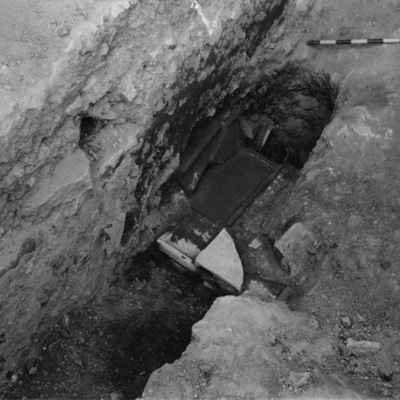 Detail of sarcophagus in northwest corner of Room 6. 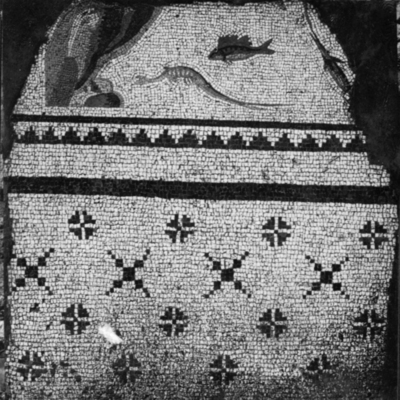 Raised section 2 of Thalassa mosaic in Room 6. 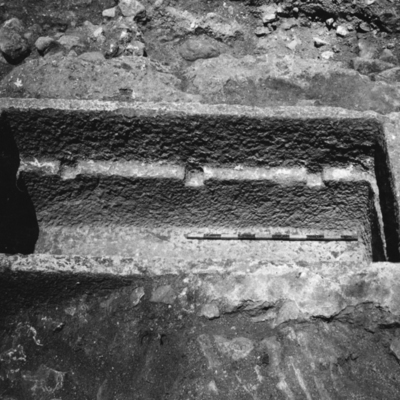 Detail of drain near Room 6. 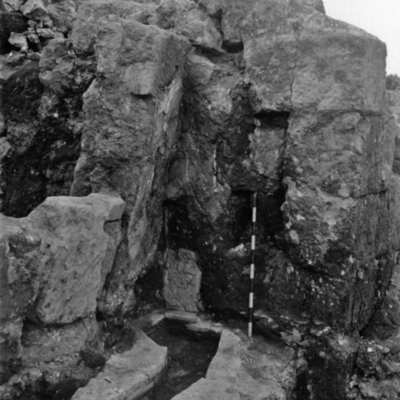 Detail of fountain in inner courtyard (Room 6) of building B. 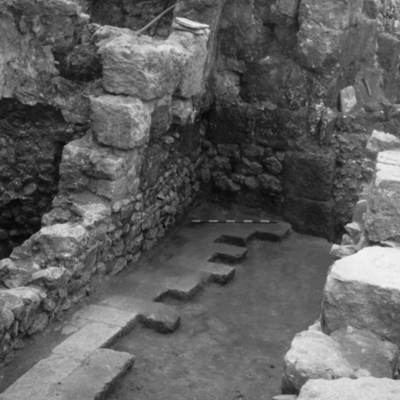 Corner of inner courtyard (Room 6) in building B. 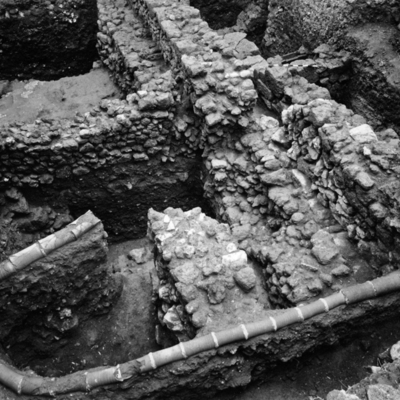 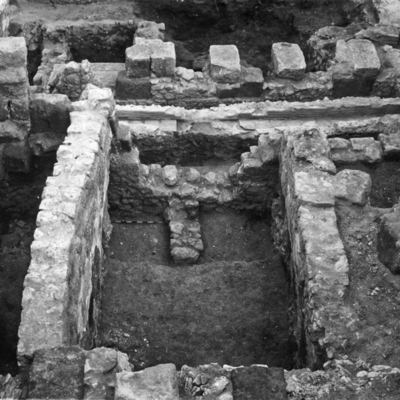 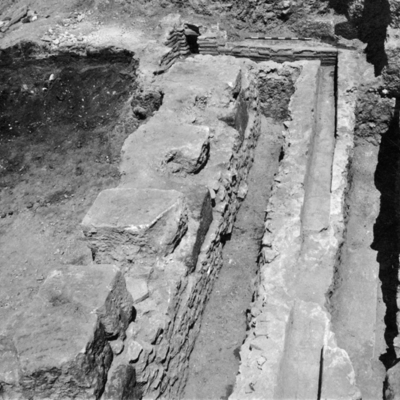 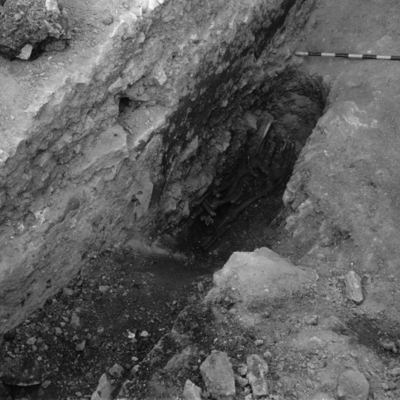 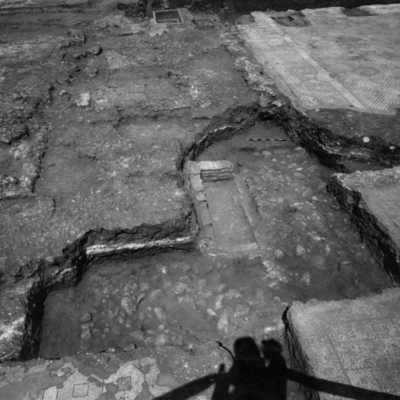 General view of Room 6 in trial trench 1.